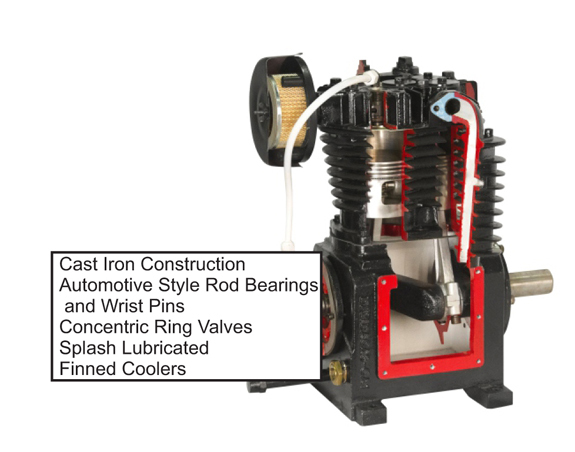 BelAire Air Compressor’s Iron Series Compressors feature all cast iron design pumps. Models include simplex compressors up to 10hp and duplex models from 10 - 20hp. Choose from our standard or ELITE (full featured) models. All Iron Series Compressors come with the 2 Year Bumper to Bumper Warranty with no additional purchase required. Standard Electric units include Magnetic Starter and manual drain, ELITE units also include Low Oil Level Switch, Automatic Tank Drain and Beltguard Aftercooler. Gas Drive Compressors come standard with Electric and Recoil Start.